HOT ROD SLED SHOP INC. CREE LED headlight kit for REV GEN4 sleds. CREE LED bulbs create a SUPER WHITE beam more than twice as bright as stock bulbs. 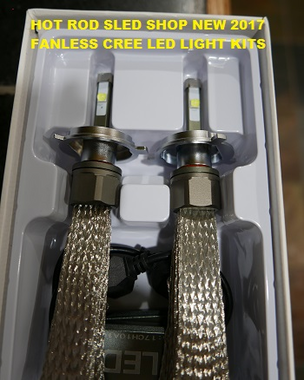 These are waterproof IP68 rated with hi/low beam 10,800 lumen bulbs with a 6000K light spectrum (bright white color). This is new August 2017 TECHNOLOGY with no fans but a tin coated copper heat synch which makes a really easy install and superior heat dissipation. The ballasts are small and mount with zip ties or two sided tape. These are more reliable than HID and much more durable. We offer a full 2(two) year warranty on these lights in house!